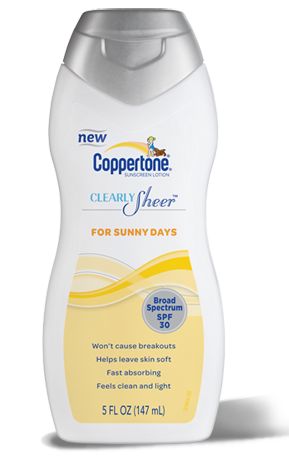 I was very excited when I was asked to try out the new Coppertone Clearly Sheer Sunscreen line. It comes in two versions: Sunny Days with spf 30 for everyday and Beach and Pool in spf 50 for extra protection. We are a pretty pale family so we definitely tend to burn when we spend much time out in the sun. In the summer, we spend a lot of time in the pool. Fresh light citrus fragrance with soft floral base notes. When my box arrived, we were packing up for a week long vacation at the beach. What better time to fully evaluate this sunscreen. 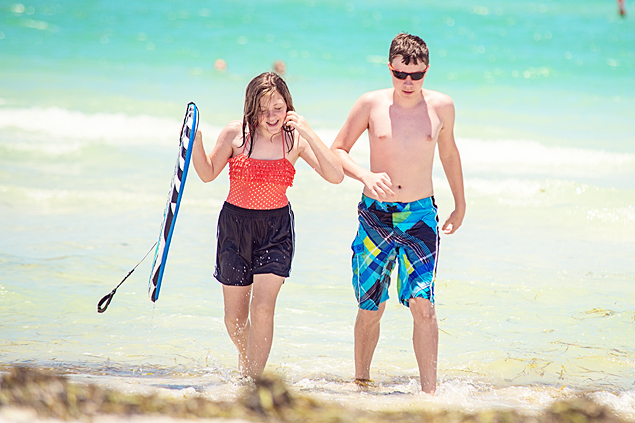 A couple of my kids have a long history of getting some nasty sunburns while at the beach. This time we were determined that wasn’t going to happen. Very lightweight. Not heavy or too thick to absorb well into our skin. It literally felt like we didn’t have anything on at all. Matte like finish. LOVE not having that typical greasy sunscreen feel. Lovely light citrus smell. However, it is very faint so you could easily mask it with your favorite perfume or body spray. Love that! We used the SPF 30 and it worked perfectly. We came in from the sun without any signs of a sunburn. Excellent for wearing under make-up. If you are planning to try this yourself, you can find a coupon here. 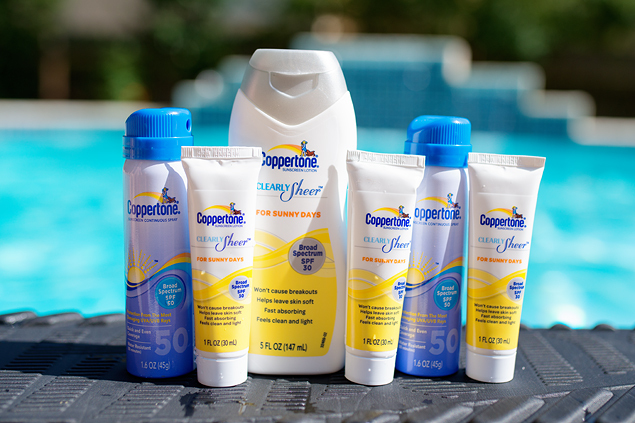 They also sent us the Coppertone Travel Size Continous Spray in SPF 50. This SPF 50 was perfect for my oldest son because he has super sensitive skin thanks for a medication that he took when he was younger. Easy to apply but just spraying all over. Smell was slightly stronger than the Clearly Sheer line, but not bad at all. Worked very well at keeping him from getting sunburned. 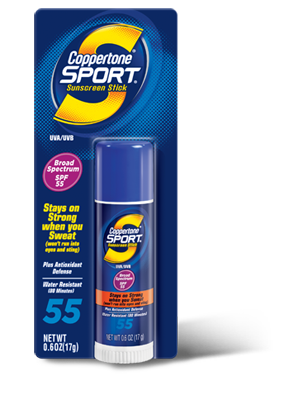 Then we had picked up this Coppertone Sport Stick ourselves to try out on my oldest son’s face. Super easy to apply anywhere that you want. Is a much thicker sunscreen. Does make your face feel like your skin doesn’t breathe well. Might not be good for super sensitive, acne prone skin. Have to rub in well in areas that you might be sweating or it will leave a white residue. 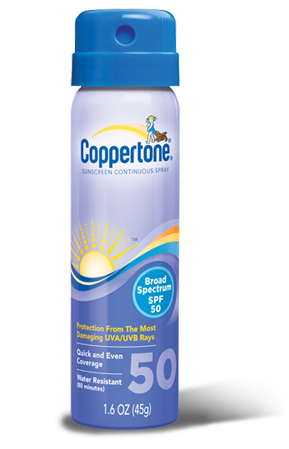 Stays on better and longer than most other sunscreens when spending a lot of time in the water. Kept him from getting a sunburn on his face. He says he will definitely continue using this Coppertone Sport Stick in the future. We also used it to cover one area of his arm that got sunburned, because we missed applying sunscreen. It worked perfectly to keep him from getting any more sun in that area. Disclosure: I was given this product from BzzAgent and Coppertone to try out. All opinions expressed here are my own.